Quilting is a method of stitching layers of material together to form a decorative design. Flat-quilting is where two pieces of cloth are stitched together with no wadding in between. A single or double line of stitches creates the pattern. Early examples such as this often use back stitch rather than running stitch to achieve a flush design. 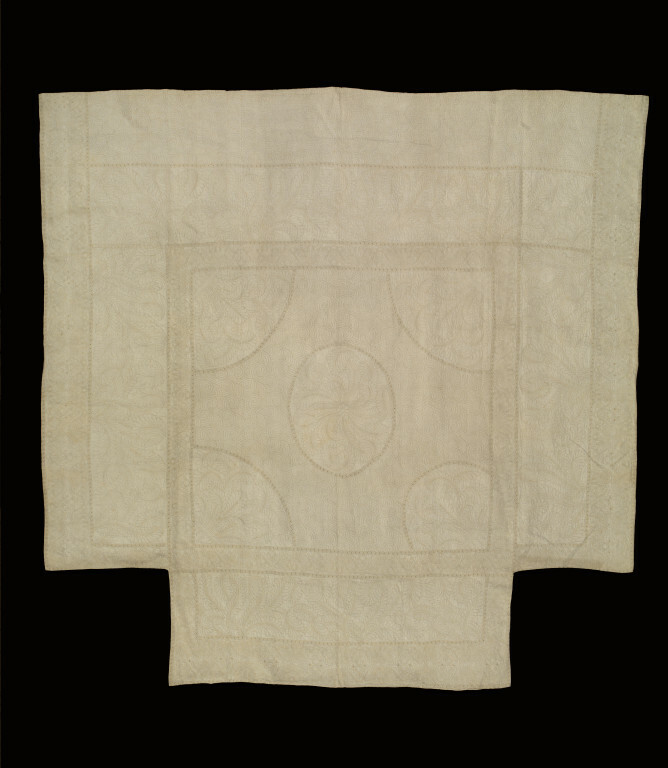 This bed cover and curtain would have originally formed part of a larger set of hangings for a four-poster bed. According to family history, they were owned by the Hynde Cotton family. Sir John Hynde Cotton (1682-1752) was an MP and leading Tory opponent of Sir Robert Walpole. A 1734 inventory of the family home, Madingley Hall in Cambridgeshire, shows that its 36 rooms were furnished to the height of luxury. Its bedrooms were names according to the colour of their textiles. 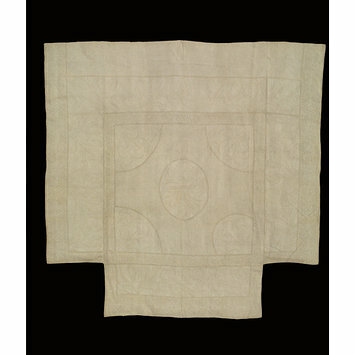 Quilted bed cover and single bed curtain, both of white linen, flat quilted through one layer only, with yellow silk in back stitch and embroidered, with eyelet holes. Both are lined with white linen. The cover has a central oval medallion, semi-circular corner pieces and wide borders all containing large, curved feather or leaf motifs; the remainder of the ground is filled with thick scroll-shaped motifs which inter-link to form a wave-like effect. The sides and top of the cover have valances made in one piece with the top, but the foot of the cover has been cut away at the corners to enable a foot valance to hang neatly. The top valance is decorated with the wave-motifs but the side and foot valances which are mainly formed by the feather-filled borders, have edging elaborately patterned with inter-laced scroll and feather motifs. All the areas are out-line by rows of tiny inter-laced scrolls, containing eyelet holes. The curtain (A) is one of a pair and decorated with a vertical panel of feather motifs in the centre and with borders along the sides and lower edge of inter-laced feather and scroll motifs (as on the sides and foot of the cover). Given by G. H. G. Norman. According to the donor's family history, this bed cover and curtain had been passed down within the family, and were originally owned by the Hynde Cottons. Historical significance: In eighteenth-century Britain, the bedrooms of the wealthy were used for the display of luxury goods. They were a place where servants entered, family members rested and guests were entertained. Beautifully worked bed hangings and bed covers were found in both middle-class and aristocratic households, and were often more costly that the bed that they dressed. The Hynde Cottons were a wealthy and well-connected family. Sir John Hynde Cotton was a noted MP. In 1724 he married Margaret Trefusis, who brought with her a substantial dowry that included real estate, £17,000 of capital, as well as her personal jewels and plate. An inventory of Madingley Hall in 1734 shows that 36 rooms were furnished to the height of luxury and fashion. The bedrooms were named according to the colour of their textiles. 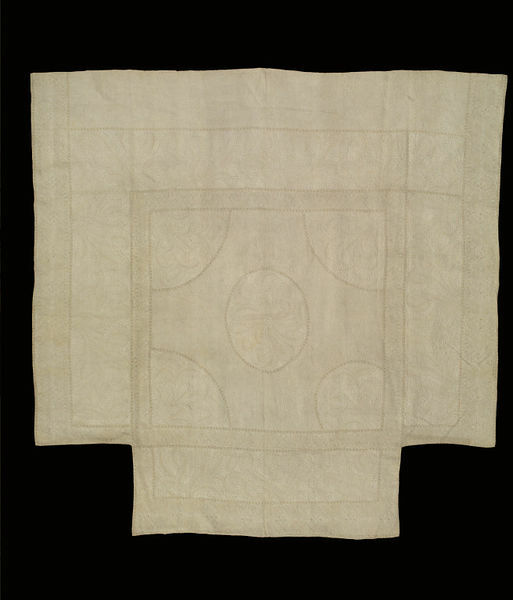 Quilted bed cover and single curtain, England, 1725-1750. These hangings were originally part of a set owned by the Hynde Cotton family. Sir John Hynde Cotton (1686-1752) was an MP and leading Tory opponent of Sir Robert Walpole. A 1734 inventory of the family home, Madingley Hall in Cambridgeshire, shows that its 36 rooms were furnished to the height of luxury. Its bedrooms were named according to the colour of their textiles.